Gabriela Ramos-Mata. Courtesy of the subject. From a young age, Gabriela Ramos-Mata couldn’t grasp the concept that anyone would want to intentionally kill their child. As a kid in the fourth grade, she heard news about Hillary Clinton and her stance on being pro-choice, defending late-term abortion. This sparked her curiosity, motivating Ramos-Mata to ask her mother about the topic. Since then, Ramos-Mata has been a pro-life advocate, using science and facts to convince others to join the movement. The morality and legality of abortions has been a palpable nationwide debate since the 1960s and is still going today. According to a Gallup poll, 64 percent of Americans agree with the 1973 Roe v. Wade decision that established a woman’s right to an abortion. The other 28 percent do not. Many of the latter identify as pro-life advocates, including the religious, the conservative and those who have seen the horrors of abortion with their own eyes. Different pro-lifers have different reasons for not supporting abortion including a strong belief that they carry a high risk of potential physical, emotional and mental harm for women. Many more believe that abortion is just a medical means of murdering a child. Reasons such as these are why Ramos-Mata opposes the risks associated with abortion. Abortion is a highly personal experience and different for every woman. It can be emotional—some feeling a sense of relief while others experiencing depression, regret or anxiety. There is always a risk that someone is more prone to emotional distress after an abortion based on religious beliefs or their previous emotional and psychological concerns. Physical side effects of abortion also vary from woman to woman, including cramping or abdominal pain, vomiting and nausea. According to the American Pregnancy Association, serious complications occur in fewer than 1 out of 100 first trimester abortion. For late term abortions, there is a 1 out of 50 ratio of women that might experience these complications, such as sepsis, the scarring of the uterine lining and damage to other organs. “Some would argue that I’m an anti-feminist, which I find fascinating given that I’m a woman,” said Ramos-Mata. According to her, a true feminist wouldn’t support the idea that a woman can’t make it on her own through an unplanned pregnancy. “True feminists” would support the mother because she can manage the pregnancy, and would believe that she’s capable enough to use her resources such as crisis pregnancy centers to find the support that she needs. Ramos-Mata couldn’t let her passion go. Since then, she has gone to a number of marches, written to state representatives and stood outside numerous Planned Parenthoods speaking to and supporting women that were starting local crisis pregnancy centers. Crisis pregnancy centers (CPCs) are meant for women facing unplanned pregnancies. Many of the centers associated with Christian charities. They are nonprofit organizations that provide pregnancy tests, pregnancy decision coaching and information about pregnancy options. Planned Parenthoods are funded by the government, providing health care such as STD testing and treatment, birth control, cancer screening and prevention, abortion and general health care. Not only has Ramos-Mata supported crisis centers, but she has also actively involved herself in student organizations. Students for Life is an organization that hosts a number of their own pro-life conferences. Formally known as the American Collegians for Life in 1977, it began as a full-time operation in 2005. For the school year of 2016-2017 alone, the organization was able to visit 641 individual school campuses, start 146 new groups and host 18 regional leadership summits that had 181 schools present. “Our mission is to abolish abortion because to us, abortion is the biggest trending human rights atrocity of our day. We don’t believe that you have different human rights as you age,” Matt Lamb, the Director of Communications for Students for Life said. Their argument is ultimately that an unborn child has the same amount of human rights and dignity as a full grown adult. A fetus conceived by its parents is growing according to its unique genetic code, which is by definition a human, Lamb said. Although embryos are a strange looking stage in the human development process, and fetuses don’t yet look like adults, there is still a common humanity at all stages of human development. Human rights are meaningless if it doesn’t apply to all human beings. Thus, there is no distinction between the unborn human and its human rights, Lamb argued. There are younger advocates too. 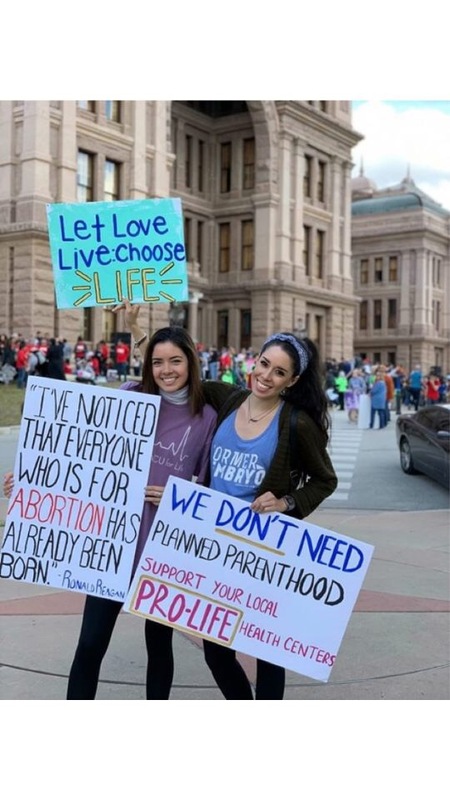 Brianna Beauregard, a 16-year-old, is one of many teenagers who believe in the pro-life movement. Although she comes from a religious family that’s pro-life, Beauregard prefers to use facts in arguments over religion. “Life begins at conception. To ignore that is to ignore science, meaning that abortion is the murder of babies,” Beauregard said. She feels that you can’t dictate what a women does and doesn’t do to her own body. It’s true that a woman’s body is greatly impacted by pregnancy, but abortion is the choice of removing a separate human being from growing. Abortion isn’t removing a part of a woman’s own body, but it destroys a separate, unique individual, Beauregard said. Although this is a belief held by many pro-life advocates, those that are on the opposite end of the argument would disagree. Unlike newborns, fetuses are unable to continue living if they’re unsupported by their mothers. Scientific research also says that until the 24th week of pregnancy, a fetus can’t feel any pain because they don’t yet have a brain. Facts such as these suggest that abortion isn’t murder according to pro-choice advocates. A Public Religion Research Institute found that a majority of Americans (54 percent) say that abortion should be legal in all or most cases while 43 percent say that it should be illegal in all or most cases. However, in the last decade, public views on abortion haven’t substantially changed. Those of who believed abortion should be legal in all cases in 2008 were 57 percent of Americans while those that thought it should be illegal was at 36 percent. Julia Batista is a first-year journalism major who likes getting the inside scoop. You can reach them at jbatista@ithaca.edu.